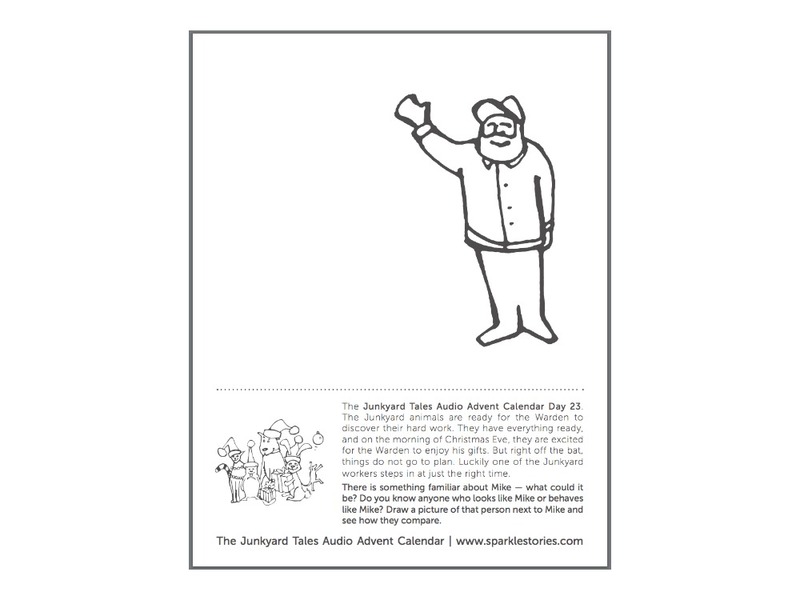 The Junkyard Tales Audio Advent Calendar Day 23. The Junkyard animals are ready for the Warden to discover their hard work. They have everything ready, and on the morning of Christmas Eve, they are excited for the Warden to enjoy his gifts. But right off the bat, things do not go to plan. Luckily one of the Junkyard workers steps in at just the right time. There is something familiar about Mike — what could it be? Do you know anyone who looks like Mike or behaves like Mike? Draw a picture of that person next to Mike and see how they compare. Jeannine Tidwell is co-founder and co-director of Twin Eagles Wilderness School, a family-centered organization offering programs to people of all ages and serving the greater Inland Northwest. She is mother to two beautiful boys. She loves gathering wild foods, sharing nature with others, soulful poetry and living life to the fullest. It is her hope that this game will help you deeply connect you with nature, yourself and your friends, family and community and most important – have fun!